The genus Elseya or Australian Snapping Turtles are indigenous to Australia, New Guinea and Indonesia. The type species for the genus is Elseya dentata, the Northern Snapping Turtle. For many years the members of the Elseya latisternum generic group has been referenced in here as well. Of recent times it has been demonstrated that the E. latisternum group actually form a unique genus (Georges and Adams, 1992, 1996; Thomson et al. 1997). Elseya dentata (Gray, 1863) from the Northern Territory and northern Western Australia, Australia. of southern, coastal Queensland, Australia. Elseya irwini (Cann, 1997b) from central coastal Queensland, Australia. Elseya lavarackorum (White and Archer, 1994) from Riversliegh, Northern Queensland, Australia. region of the Northern Territory, Australia. central Queensland, Australia. (sensu Thomson 2000). de Vis, C.W. 1897. The extinct freshwater turtles of Queensland. Annals of the Queensland Museum. 3: 3-7. Cann, J. 1997a. Georges short-neck turtle. Monitor 9(1):18-23. Cann, J. 1997b. Irwin's Turtle. Monitor 9(1):36-40. Georges, A. and Adams, M. 1992. A phylogeny for Australian chelid turtles based on allozyme electrophoresis. Aust. J. Zool. 40: 453-476. Georges, A. and Adams, M. 1996. Electrophoretic delineation of species boundaries within the short-necked chelid turtles of Australia. Zool. J. Linnean Soc., Lond. 118:241-260. Georges, A. & Thomson, S. 2010. 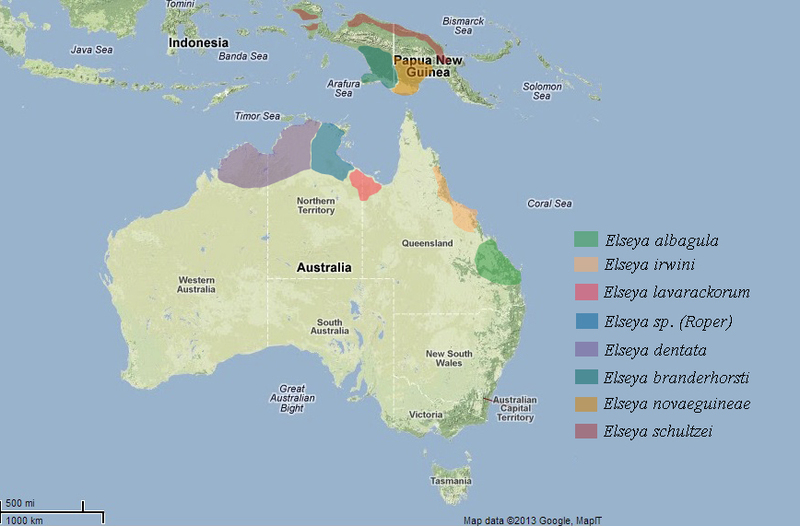 Diversity of Australasian freshwater turtles, with an annotated synonymy and keys to species. Zootaxa in press. Gray, J. E. 1844. Catalogue of the Tortoises, Crocodiles and Amphibaenians in the Collection of the British Museum. London. Edward Newman. 80pp. Gray, J.E. 1863. On the species of Chelymys from Australia, with the description of a new species. Annals and Magazine of Natural History. 3(12):98-99. Gray, J.E. 1867. Description of a new Australian tortoise. Annals and Magazine of Natural History. 3(20):43-45. Meyer, A.B. 1874. Platemys novaeguineae sp. nov. Dr W.H. Peters legte vor: Eine mitteilung von Hrn. Adolf Bernhard Meyer uber die von ihm auf Neu-Guinea under den Inseln Jobi, Mysore und Mafoor im Jahre 1873 gesammelten Amphibien. Monatsber. Konig. Preuss. Akad. Wiss. Berlin. 39:128-140. Ouwens, P. A. 1914. List of Dutch East Indian Chelonians in the Buitenzong Zoological Museum. Contributions a la Faune des Indes Neelandaises. 1:29-32. Thomson S. (2000). A Revision of the Fossil Chelid Turtles (Pleurodira) Described by C.W. De Vis, 1897. Memoires of the Queensland Museum 45(2):593-598. Thomson, S., Georges, A. and C. Limpus, (2006). A New Species of Freshwater Turtle in the Genus Elseya (Testudines: Chelidae) from Central Coastal Queensland, Australia. Chelonian Conservation and Biology. 5(1):74-86. Thomson, S.A. & Mackness, B.S. (1999) Fossil Turtles from the Early Pliocene Bluff Downs Local Fauna, with a description of a new species of Elseya. Trans. R. Soc. S. Aust. 123(3),101-105, 30 November, 1999. Thomson, S., White, A. and Georges, A. 1997. Re-evaluation of Emydura lavarackorum: Identification of a living fossil. Mem. Qld Mus. 42:327-336. Vogt, T. 1911. Emydura schultzei, sp. nov. Reptilien und Amphibien aus Neu Guinea. Sber. ges. naturf. Freunde, Berl. 9:410-412. Wells, R.W. and Wellington, C.R. 1985. A classification of the amphibia and reptilia of Australia. Australian Journal of Herpetology, Supplementary Series. 1:1-61. White, A. & Archer, M. 1994. Emydura lavarackorum, a new Pleistocene turtle (Pleurodira: Chelidae) from fluviatile deposits at Riversleigh, Northwestern Queensland. Records of the South Australian Museum 160-167.